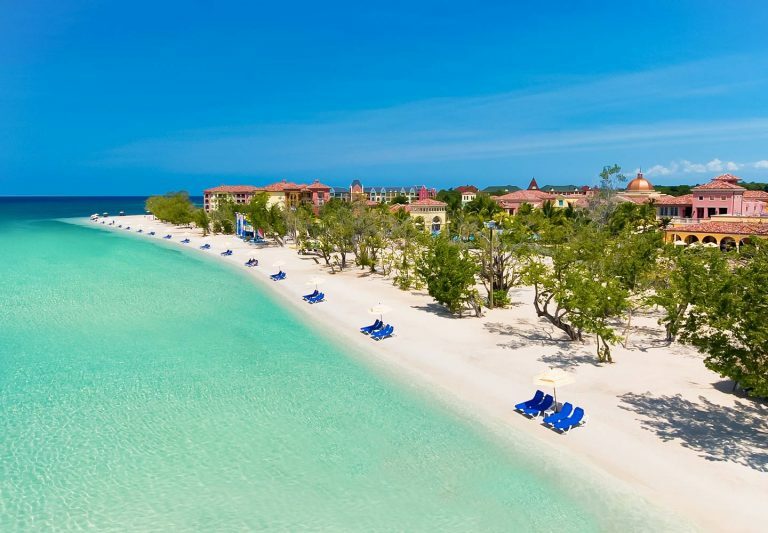 Offering the widest stretch of pristine sand on Jamaica, Beaches Negril Resort & Spa is a premium all inclusive resort which caters for everyone and anything wanting true luxury and relaxation on their Caribbean holiday. Great for families where the kids can escape and have a great time on the beach and with the wealth of activities on offer, and the parents can pamper themselves and find time to relax amongst stunning surroundings. Delicious cuisine and fine wines/premium drinks are available in the restaurants and bars, all as part of the all inclusive package. A great selection of water and land sports to partake in, or just simply relax and go for a swim in the calm warm waters of the Caribbean Sea. This is a true paradise. The resort boasts a great program for the kids, with scuba available for those over 8 years old, and a specially designed and built water park, with pirate ships, slides and a lazy river – there’s even basketball, football and more! There is a kids club with professional staff, an xbox lounge, DJ academy and a nightclub. Unique and extensive treatments are on offer at the resort spa, where you will free your body and soul during a massage or body treatment. European and Caribbean techniques combine to give you a lovely experience while your troubles all float away. In September 2012 the resort was awarded platinum status by EarthCheck, the benchmark environmental certification body for the travel and tourism industry. It was awarded for the continued support for sustainable practices and commitment to local community projects. With such impressive accolades and facilities, it is not hard to see why Beaches Negril Resort & Spa is such a revered hotel, and sees guests returning time and again. All rooms have air conditioning, amenity kit, hair dryer, telephone, safe, CD/clock radio, TV, ironing kit and private bath/shower. Additionally the suites have a sitting area, stocked bar and plush his/hers robes. Luxury Rooms – Luxury is never taken for granted, with an impressive list of amenities as standard – including mahogany beds, cable TV and movies (pay per view), internet access and all the little touches to make your stay convenient and comfortable. Concierge Rooms and Suites – With the use of your dedicated concierge, they can help book excursions, make dinner reservations and restock the in-room mini fridge. The service extends to dedicated check in desks, orientation of the resort and a weekly reception. Butler Rooms and Suites – The last word in luxury here at Beaches, spacious suites and every possible convenience and amenity. Marble baths, en-suite bar stocked with spirits and wines, and your own butler service including the option to wine and dine on your private terrace. A great selection of meals is on offer at Beaches Negril Resort & Spa, with enough to suit everyone’s tastes and appetites. There is somewhere to eat and drink every hour of the day, and with 7 great restaurants offering up cuisine from around the world you really will be spoilt for choice. From seafood to made-to-order pizzas made in a wood-fired oven. Each restaurant offers its own unique atmosphere whether you want to dress to impress or walk in wearing shorts and t-shirt. One thing is certain, service with a smile! The Mill – This lovely atmospheric restaurant is made in the style of traditional sugar mills, such as those found ruined and abandoned throughout the Jamaica countryside. With hearty local fare on offer, you can enjoy views out over the pool and the sea beyond in this open-sided setting complete with sloping roof. Dress code is resort casual. The Venetian – Classic Italian dishes will dazzle the taste buds, while stunning design, candelabra and crystal chandelier and accented with dark woods and gorgeous ocean views. Great service and cuisine, suitable for the whole family. Dress code is resort evening attire. Kimonos – A great Asian dining experience is waiting for you at Kimonos, beneath a canopy of bamboo, authentic teppanyaki tables and Japanese artwork on the wall panelling. The chefs will dazzle you with their expert knife work and the delicate flavour of the seafood and flavours. A true oriental experience in the Caribbean. Dress code is resort casual and reservations are required. Arizona’s – On the steps of the kids’ pirate water Park, by day this beach grill serves up all your favourites, from burgers to hotdogs. Come the evening it transforms into a great tex-mex restaurant. Lit by candlelight with the sea breeze to cool you down you can chow down on nachos, fajitas and a host of other southwestern fare! Dress code is resort casual. BBQ Park – Open through the day and into the early hours, you can grab a wrap, burger of a jerk speciality and bring it back to the beach, or take your time over lunch on the patio. Dress code is resort casual. Dino’s Pizzeria – Made to order with fresh high quality ingredients, and cooked the traditional way in a wood-fired oven. No dress code. Stewfish – A great seafood restaurant right on the beach. With local delicacies with true Jamaica flair, suitable for the whole family. Open 6 days a week. Dress code is resort casual. The onsite spa at the Beaches Negril Resort is a great place to unwind and relax on a day off from the activities on offer, or exploring the island, or if you want to soothe those aching muscles after a morning swim or a good session in the fitness centre. There is a long list of treatments on offer to pamper you and get those knots out of your back and shoulders!